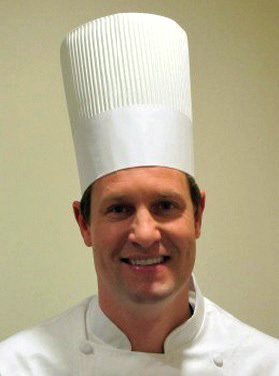 Wearing a traditional white chef’s coat and hat, Jason Tingley is the MLB All-Star of stadium concession dining at LA’s Chavez Ravine. Working diligently behind kitchen doors as Lasorda’s right hand man, Tingley has earned his fine culinary reputation as a first-class restaurateur in the past at local favorites Patina and Water Grill. Now bringing his magic to Tommy Lasorda’s Trattoria, the down-to-earth chef is making baseball fans crave for his scrumptious menu at Dodger Stadium. What began as peasant food by mixing flour, water, salt and yeast topped with seasonal ingredients cooked by Italian bakers using the residual heat in their ovens, pizza has become a blank canvas for artisans to create signature pies for even Hollywood’s rich and famous. Yet, Chef Tingley has made sure everyone can afford to eat his delicious food at Lasorda’s Trattoria. 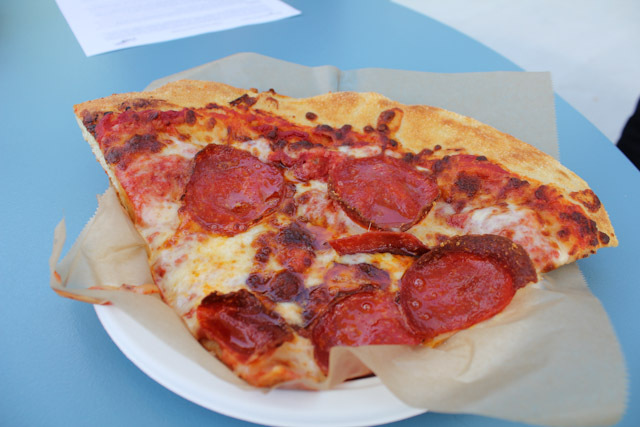 Pepperoni pizza slices at Lasorda’s Trattoria are often larger than the plates they are served on. 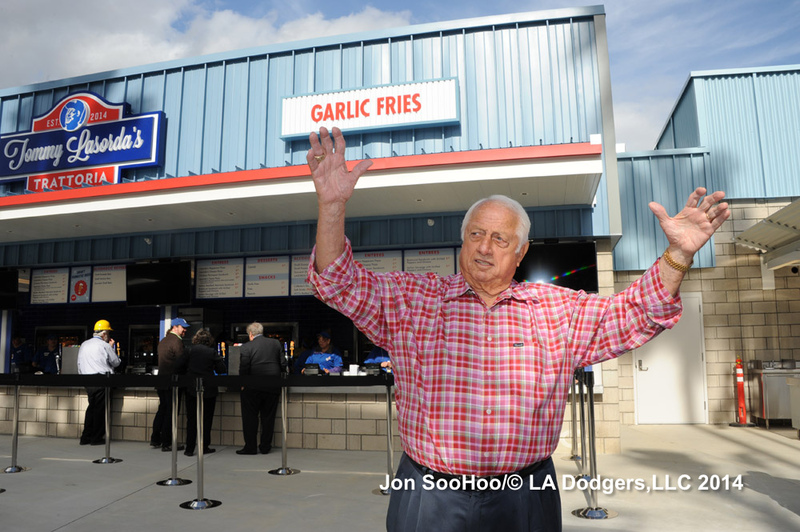 Tommy Lasorda raves about his Italian Trattoria. 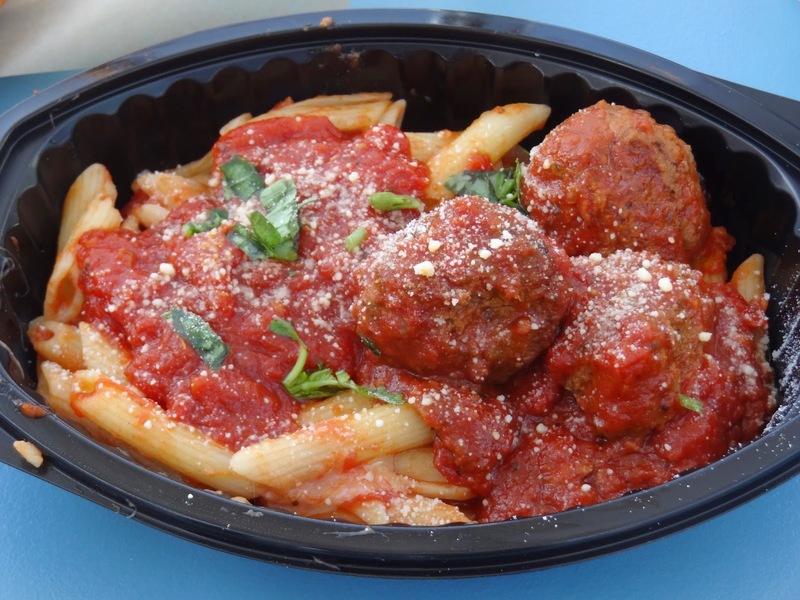 Whether enjoying Tommy’s favorite–a bowl of penne pasta served with red sauce and a mountain of delectable meatballs–which Lasorda swears to taste closest to the way his mother used to make them at home, a Chicken Parmesan sub covered in marinara or a spicy Italian sausage sandwich with peppers and onions, fans cannot go wrong with the plethora of options available at Lasorda’s Trattoria. Diners are guaranteed to leave with an ear-to-ear grin after eating cannoli and gelato for dessert. Now that’s Italian!! Mangia, mangia…and buon appetito LA Dodgers fans and family!!! 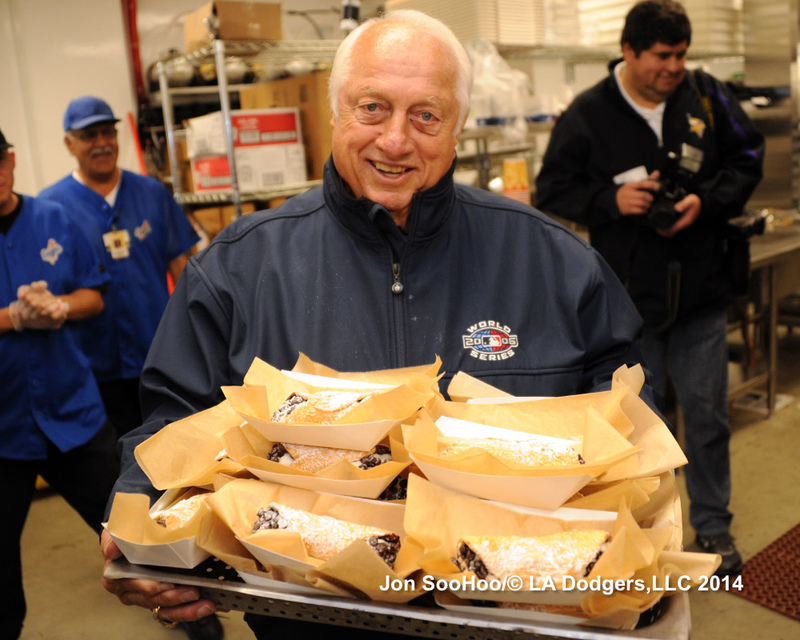 Cannoli are a hit at Tommy Lasorda’s Italian Trattoria. 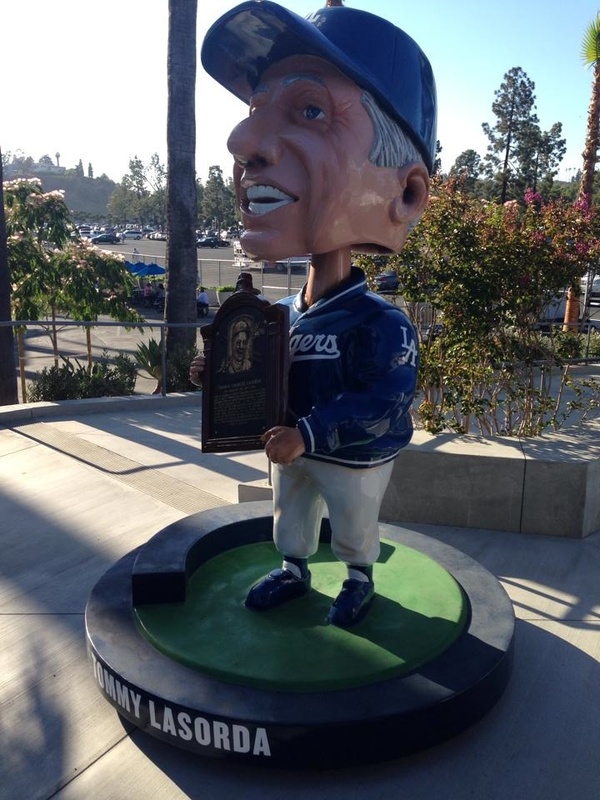 A beloved Dodger family member and icon, a renowned international baseball ambassador, and a very important ingredient to the Dodger brand, Tommy Lasorda bleeds Dodger Blue. 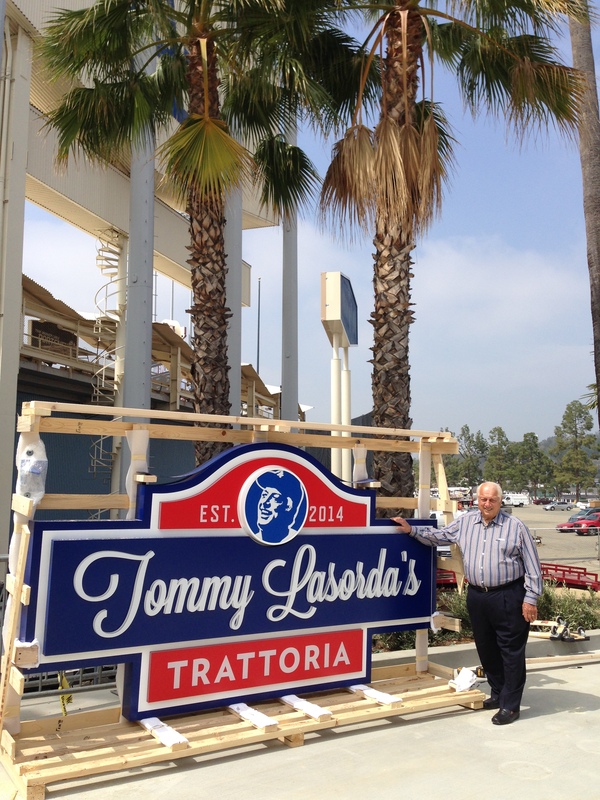 When the club opened the new Tommy Lasorda Italian Trattoria at Dodger Stadium, it immediately became a fan favorite. The legendary Hall of Famer worked together with Dodger Stadium Executive Chef Jason Tingley on all of the dishes to make sure the food received the Lasorda Family stamp of approval. “I would never ever in my life put my name on something that wasn’t properly done,” he said. The former Dodger manager and current special adviser to the chairman lent not only his name but shared some of his family secret recipes to authenticate the traditional Italian cuisine offered by the establishment located in the Outfield Pavilion Plaza. A true lover of Italian food and culture, Lasorda consulted on every aspect of the menu–including his mother’s famous recipe for meatballs–which are served as a sandwich or with al dente penne and cheese. “If you don’t like these meatballs, you don’t like Christmas or Easter. When they asked to put my name on the restaurant, I said sure–but the food better be good!” The hefty slices of cheese and pepperoni pizza keep the fans smiling, while the desserts ensure them coming back for more. With Tommy Lasorda’s Trattoria now open, one understands why the Italian American believes Dodger Stadium is Blue heaven on Earth. 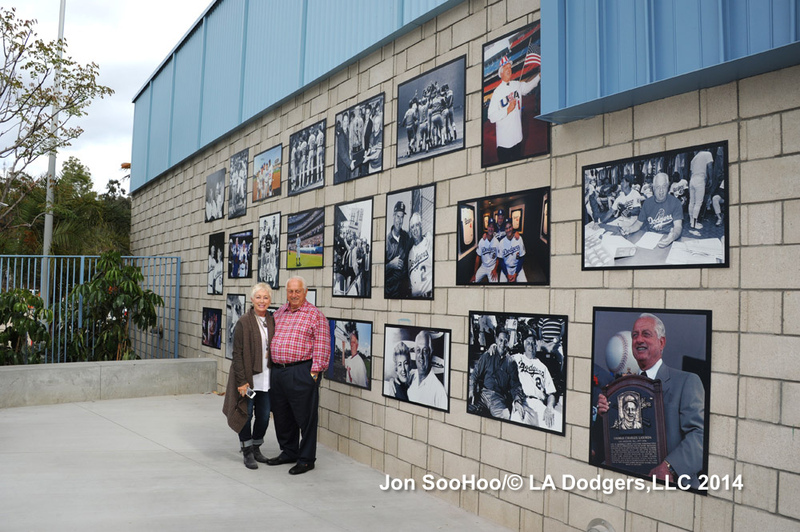 Accompanying his daughter, Laura, Tommy poses near the Lasorda Tribute at Dodger Stadium.